So, I had this great idea for a business for someone to start up. When you order toothbrushes online from a supermarket you can’t choose the colour. 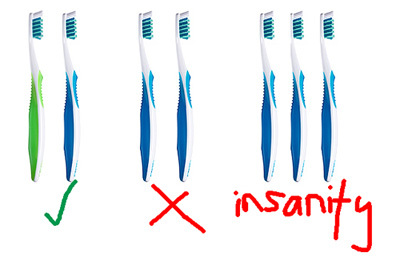 This is obviously terrible, I mean who wants to end up with a blue toothbrush when everyone knows your’s are always green and someone else’s are always blue. It would be madness. How about someone enterprising out there buys a few thousand of each make and model so they would have the full range of colours, and then sets up an online shop (eBay would be fine) where you could choose the colour you wanted. I would certainly use such a service, as long as (1st class) postage was free and they cost no more than at Tescos. I appreciate there’s no money to be made from this (otherwise I’d be doing it already), but you would make lots of friends and it would solve one of modern life’s biggest dilemmas. PS An EP is forthcoming. I could take or leave trainagles, and although I do love a good blue toothbrush sometimes life throws you a green, you gotta roll with it. One thing I do LOVE however is your music and I can’t wait for the new album/EP. Take it easy and don’t falter.